When your family, friends or guests bite into these chewy brown sugar cookies they will be surprised to discover a delicious kiss of chocolate hidden inside. Better make plenty because they will disappear quickly! 1. Heat oven to 350 degrees F. In a medium bowl, combine the butter and brown sugar; beat with electric mixer at medium speed until light and fluffy. Add the vanilla extract. 2. In a medium bowl, combine the flour and cinnamon; add to the butter mixture and mix well. 3. Shape dough into twenty-five 1-inch balls; flatten each into a 2-inch round. Place 1-inch apart on 2 ungreased baking sheets. Place 1 chocolate candy in the center of each round. Enclose the candy with the dough being sure the candy is completely sealed in the dough. Bake until golden, about 15 minutes. 4. 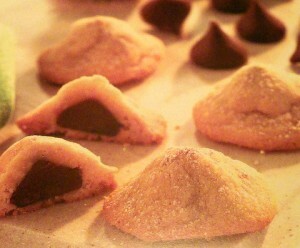 In a small bowl, combine the confectioner’s sugar and cocoa; sprinkle over the hot cookies. Cool cookies on baking sheets for 10 minutes, then transfer to wire racks to cool completely. Makes 25 cookies. Good morning Emily. I just knew you would be sharing some special recipes before the holidays. This is great for our family Christmas cookie day. I love to make something different every year. We are supposed to come up with two NEW cookies to bake each Christmas. I have 4 sisters and cookie day is a special time together. Have a wonderful Thanksgiving with loved ones all around you Emily.